If you're feeling harried and your Christmas spirit is flagging, this seemingly unplanned event, actually a flash mob performance orchestrated by Canadian music students, will refresh and uplift you. It truly is ambrosia for world-weary souls. From the kitchen of One Perfect Bite...I first made this dish in August when sweet corn was plentiful. I found the recipe in Bon Appetit magazine and the pesto was unusual enough to intrigue me. At that time, I made the dish with fresh corn and Bob and I really liked the distinctive and sweet flavor it gave to the pesto. 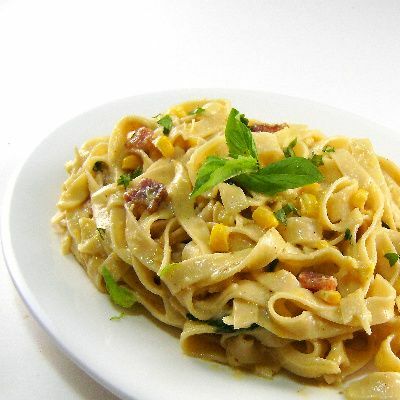 The finished sauce is similar to a carbonara and almost as easy to make. I wanted to make something light for last night's supper and Bob suggested this. With no fresh corn on hand, I decided to make the pesto using frozen shoepeg corn. I've had great luck using shoepeg as a replacement for fresh corn. It is lighter in color and more tender that other types of frozen corn and it's as close to the fresh product as you can get in December. I can happily report it worked well in this recipe. While I used fresh fettuccini to make the dish, a top quality brand of dried pasta would also work well. I do hope you'll try this. I know it sounds a bit strange, but it really is lovely. Here's the recipe. 1) Cut each bacon slice in half length-wise, then crosswise into 1/2-inch pieces. Cook in a large nonstick skillet over medium heat until crisp and brown, then transfer to a paper towel-lined plate to drain. Pour off all but 1 tablespoon fat. 2) Add corn, garlic, salt and pepper to skillet, and saute until the corn is just tender, but not brown, about 3-5 minutes. Transfer 1 1/2 cups of the corn to a small bowl and reserve. Transfer remainder to bowl of a food processor. Add walnuts and Parmesan. With machine running, slowly add oil through the feed tube and blend until pesto is almost smooth. Set aside. 3) Cook pasta in a large pot of boiling, salted water until just tender, but still firm and not quite as done as you would want it. Drain pasta, reserving 1-1/2 cups pasta water. Return pasta to pot and add corn pesto, reserved corn kernels, and 1/2 cup basil leaves. Toss well and add pasta water 1/4 cup at a time until desired consistency is reached. Cook an additional 2-3 minutes, or until pasta is cooked through. Season with additional salt and pepper if needed. 4) Divide among serving bowls and sprinkle with additional herbs, cheese, and reserved bacon. We just happened to have a very similar recipe for dinner tonight, but we were missing half your ingredients and yours looks much better. Love the Hallelujah chorus. What a cool and unique pesto - perfect for when you're craving a bit of summer when it's cold out! it's like sunshine on a plate. will definitely perk up a hazy and cold winter night! I hope you enjoyed your weekend Mary! I love my Canadian friends. What a show Mary. My husband started cooking, so i'll be showing him some of your awesome recipes for sure. He's trying to get me involved, sooner or later I'll give in : ) Right now i just like eating what he serves. Happy Blue Monday! And does that look absolutely amazing!! When I come up for air.. I will have to try it! I love unusual combinations and when it comes to pasta I never say no! Flashmobs always make me smile...as does corn pesto! A little sunshine in this dreary Paris weather is just what I needed. Thanks, Mary! Happy Blue Monday! Your fettuccini sounds deleicious. I'll have to save this one too. Happy Blue Monday! I love that flash mob clip. But, I especially love that fettuccini dish. Looks lovely and fresh! I've actually been dying to make this since Bon Appetit published it but thought I would have to wait until next corn season. Thanks so much for the shoepeg corn tip-off! I'll have to seek it out! This looks really good. Never would have thought to make a pesto from corns! Hope you are having fun preparing for Christmas! Those flash mob things are crazy! I've seen a couple different ones, this is a great one! I have had a lot of different pesto's in my time, but corn pesto? Definitely going to have to try this one! How funny, when I glanced at your heading, I thought it was blue corn pesto... funny what your eyes can do! This looks nummy and filling and perfect for a cold winter's day! I think I commented when you first posted the corn pesto because it was unusual but I promptly forgot it (read too many blogs :). I'm glad Bob suggested it so that I could be reminded of this recipe. I must try it. P.S. Thanks for linking my post about caper pesto. looking soo yummy. i love pasta! Hi Sweetie, I made some last night for Mr. P and the grandson didn't think to add corn, will definetly add this to my list of favs. I never would have thought to make corn pesto, but this sounds excellent. Happy holidays to you! It is always yummy here. happy blue Monday. Thanks for sharing that wonderful video, Mary. I would love to have been sitting in that mall. Wow - thanks Mary. You're so right. The video is uplifting and this world weary soul needed a boost. Thank you so much - your timing couldn't have been better. I would love to have rite now, irresistible..
What a delightfully interesting idea! I've never seen shoepeg corn at the market, but I think I'll try this with some regular frozen corn I've been trying to find an application for. Doesn't corn just sweeten things up! Mmmm fettuccini is one of my all time favs =) I am starving just looking at this! That video is just what I needed to see and the fettucine looks just delicious! Wow, looks lovely! I think a plate of this - this week would be the perfect way to unwind!!! Corn pesto is new to me and as I love corn and pesto both..this is definitely bookmarked..Awesome dish! Thanks for sharing the video, Mary, it was truly lovely. The pasta looks fantastic too, what a delicious combination of ingredients! I loved that video. So inspirational and your recipe sounds so good. Have a great Blue Monday. I love the idea of corn pesto! I've seen that video, and yes, it is beautiful and a favorite song of mine. I could put anything over pasta and think it's great, so this recipe fits the bill! Merry Christmas to you and your family, Mary! The corn pesto sounds quite intriguing. I have enjoyed the idea of pesto once I realized I can make it myself and there are so many options. Love the sound and the look of this recipe. great idea with that pesto.Wishing you a grest week. Although unsual and I had never really come across such a pesto...I am also very intrigued. I don't see any reason why this wouldn't be something delicious on pasta. I'd love to be part of a flash mob...though not a singing one as I can't carry a tune. Love this, thank you! A friend sent me a copy of this musical presentation; I loved it! oh how loved that flash mob video, thanks for sharing. i would pay money to get caught in a mob like this, what a fun experience! this looks amazing, i've never heard of corn pesto, but it sounds brilliant. enjoy your monday! Oh my goodness yum,yum,yum,and the hallelujah chorus too ! Thank you for such an awesome Blue Monday post . Corn pesto sounds so exciting and I am a big pasta fan so I'm saving this recipe to try later. Love the Hallelujah Flash mob! This is a great idea!! !Corn pesto..i have to try this!! Corn pesto is a wonderful idea and now I'm mad I never thought of it. You do think deliciously out of the box sometimes and for that I am grateful. It looks like a perfect addition to my repertoire - and a welcome taste of summer. That flash mob youtube has had me smiling since early November! Corn pesto! Wow, that is innovative! this is delicious, I love to have a plate now. This sounds wonderful - it's practically a pantry dinner too, and easy to keep the ingredients on hand. Beautiful dish! I am sure it tastes as delicious as it looks!!! Wishing you a beautiful holiday! I liked it and your description (of course, plus your picture) that I am printing it off now and I love shoepeg corn too. This dish has everything I love. Thank you for sharing. Hope you have a Merry Christmas!